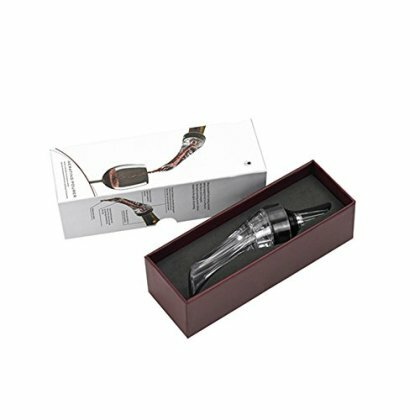 Seller Comments - This Wine Aerator Gift Set Box comes with additional wine stopper to secure your wine. AERATE YOUR WINE TO INSTANT SMOOTH TASTE & PERFECTION - The Wine Aerator Pourer has 3 aerating chambers and air intake system that utilizes the Bernoulli Effect to infuse your wine with the OPTIMAL amount of oxygen, that gives that "WOW" instant smooth taste. EASY TO USE AND WASH: The drop stop leak guard prevents spillage and mess so that you get to enjoy every single drop of wine. Its also easy to wash, just rinse under running water and dry. WINE STOPPER: This comes with 1 wine stopper to keep your wine secured. QUALITY & DESIGN: This Wine Aerator is made of Acrylic rubber material, and the feel is smooth. SAFETY : The Product egdes is smooth and can be used safetly around kids, while you enjoy your wine with ease.